Have you listened to Sawdust yet? You know, I once had a theory. The best songs are on the B side. I even got a customized license plate: B SIDE. But in the digital age it is hard to notice when a B side is actually offered on a single, let alone an album. And when a "B sides" album is released, we are conditioned now to view it with a skeptical "what are they trying to market at me now" eye. The Killers released a collection of "B sides and rarities" (your eyebrow almost instinctively wants to raise in a sneer doesn't it!) two years ago, and they ultimately called it Sawdust. 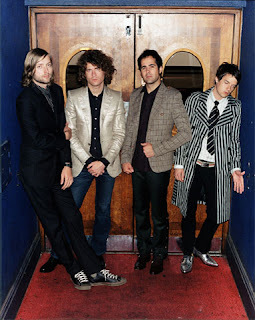 I loved almost every unreleased single on "Hot Fuss", their first album. I thought it was a good one. As you know, The Killers ended up getting insane attention and adoration, and as will happen sometimes... Many of us may have decided to turn away from them. When Sam's Town came out, I remember standing at Zia trying to decide whether to buy it. I remember word for word what I said to Mookie: "I am just not interested in what else Brandon Flowers has to say right now." Well, we didn't buy Sam's Town on that visit but of course we still ended up buying it soon after. I enjoyed it - there is just something about The Killers for me I guess - but Mookie thought it was Meh. He liked to listen to it on the exercise bike though. I have to admit I don't remember paying attention when Sawdust was released, but I followed the news about the recording of Day & Age, which came out in 2008. I still didn't even pay enough attention to that album, either. Let's make all of this right. It's time to take notice of Sawdust. Covers of Joy Division, Kenny Rogers, and Dire Straits. Uh-huh. Doesn't that sound like an odd enough collection of "b sides and rarities" for ya? A few new tracks. A few scraps from the cutting room of the previous albums. And it works. Here you go. The Killers' cover of "Romeo and Juliet" from Dire Straits' 1980 Making Movies album. Well, from the B-sides and rarities 2007 Sawdust album. We're good, right? And just because I want you to go buy this damn album for someone you know who loves b sides as much as I do, I am not going to share any of the new tracks that they put on this ditty. But here is a version of "Sam's Town" that I love. Cuz I like living in Sam's Town, quite honestly. I see London, I see Sam's Town. Hey homeslices. There are only 14 days until Christmas. Even fewer by the time you read this. Buy something! I'm in the streets fo real. Hot Damn! New Hot Chip! What Would I Want? BAND!